BREAKING: Episode VII Cast Announced! At long last, the news we've been waiting for. Lucasfilm officially announced the cast for Episode VII. Several members of the cast of the original trilogy are returning, they are: Harrison Ford, Carrie Fisher, Mark Hamill, Anthony Daniels, Peter Mayhew, and Kenny Baker. They will be joined by new stars: John Boyega, Daisy Ridley, Adam Driver, Oscar Isaac, Andy Serkis, Domhnall Gleeson, and Max von Sydow. "We are so excited to finally share the cast of Star Wars: Episode VII. It is both thrilling and surreal to watch the beloved original cast and these brilliant new performers come together to bring this world to life, once again. We start shooting in a couple of weeks, and everyone is doing their best to make the fans proud." 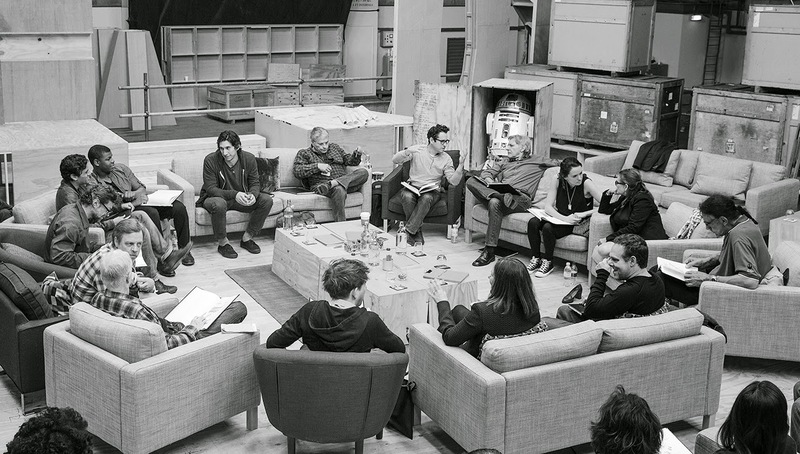 The announcement was made on StarWars.com with the above photo of the cast, along with Abrams and Producer Kathleen Kennedy at what appears to be a script read through. On behalf of the entire team here at The SWU I would like to say welcome to the family to the new stars, and to the returning stars: welcome home! Star Wars Episode VII hits theaters on December 18th, 2015 and stars Harrison Ford, Carrie Fisher, Mark Hamill, Anthony Daniels, Peter Mayhew, Kenny Baker, John Boyega, Daisy Ridley, Adam Driver, Oscar Isaac, Andy Serkis, Domhnall Gleeson, and Max von Sydow. So is this a Flash Gordon Star Wars cross-over? Will Emperor Ming now invade the Star Wars galaxy? That would be so awesome!!!!! Five words: Where is Billy Dee Williams? sad that BDW doesn't appear to be involved, but come on Ian McDiarmid?? his character is dead. I don't really care to see Billy Dee. Kinda wish Harrison Ford wasn't in this. I'm probably the only on to think this, but it was tough watching him in Ender's Game. He's just getting plain old. =/ I'm hoping the young actors will make me forget I'll be watching old people act. Mark my words,Han Solo won't be chasing Imperial stormtroopers again in this one,nor will Carrie Fisher be wearing that hairdo either. Nostalgia is deceptive!